The Alsek River is one of the most beautiful and legendary river trips in the world. It starts in the Yukon, flows through a narrow section of British Columbia, and then moves across a thin strip of Alaska before ending in Dry Bay on the Pacific Ocean. The Alsek is famous for many things. It flows through the largest non-polar ice cap in the world, it flows into incredible glacial lakes such as Lowell Lake and Alsek Lake and is almost 2 miles wide in some places. On this river you will float through Kluane Park in Yukon Territory which has the highest density of grizzly bears in North America. The Alsek also has one of the most logistically-challenging portages (read: helicopter) in the world. What the Alsek is probably most famous for, however, is Walt Blackadar's 1971 solo run of Turnback Canyon. Turnback Canyon is a 4-mile long Class V+ section of water that most modern-day boaters portage by helicopter. Blackadar's daring descent down the Alsek was, and still is, considered one of the most bold and shocking trips of all time and was highlighted in a 1972 issue of Sports Illustrated. Ron Watters describes this famous first descent in the biography of Blackadar's life entitled Never Turn Back. Planning a trip on the Alsek is a daunting task. You travel through and pay fees to Kluane National Park and Reserve, Tatshenshini-Alsek Park, and Glacier Bay National Park and Reserve. 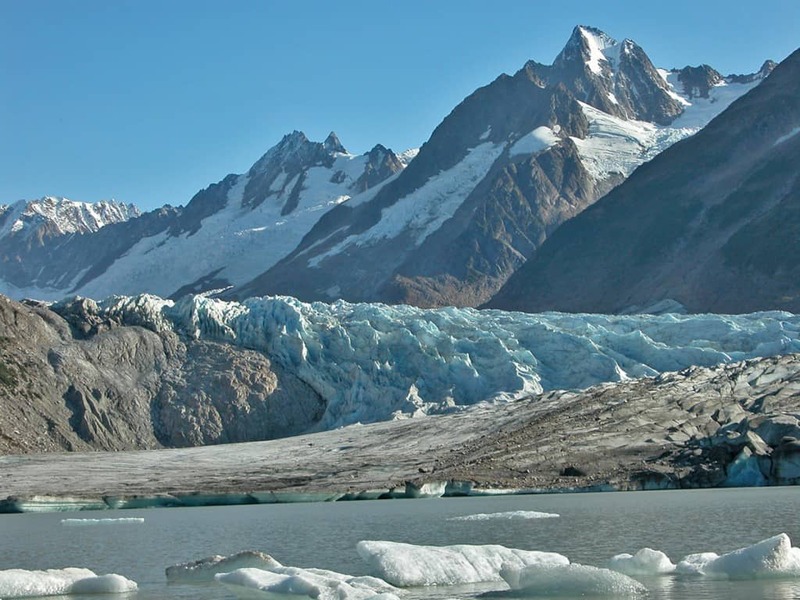 Permits required from Kluane National Park and Glacier Bay National Park. You'll also need to organize your helicopter portage around Turnback Canyon as well as small plane flights for gear and people from Dry Bay to Yakutat at the end of your trip. Mile -12: Haines Junction crosses the Dezadeash River. If you can't get to the normal put-in at Serpentine Creek this is an option that may involve extra days of fighting heavy winds and flat water to reach the Kaskawulsh River. Mile 0: Most groups put-in at Serpentine Creek. Mile 16: Confluence with the Kaskawulsh River. The Alsek River oficially begins where the Dezadeash and Kaskawulsh Rivers meet. The river flows through a "Grizzly Bear Special Preservation Area" from here to the Lowell Lake. Mile 37: THe Lowell Glacier ends dramatically in Lowell Lake. If you have time, a hike up Goatherd Mountain provides an amazing view. Mile 49.5: Lava North (IV+) is the biggest rapid (other than Turnback Canyon) on the run and should be scouted. Grizzly bears are common here. Mile 82: Beginning of Turnback Canyon (V+). Below here the river goes through a narrow gorge with the Tweedsmuir Glacier on the right. Rafting groups will need a helicopter to portage around this 4 mile long canyon. Mile 129: The Walker Glacier is a wonderful place to camp and go hike up to and on this awesome glacier. Mile 174: Take-out at Dry Bay. Here you'll pack up your gear, load it into small planes and fly to Yakutat.